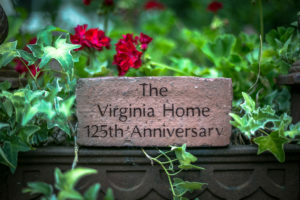 Be a part of the rich history of The Virginia Home. Purchase a personalized brick to be placed at the entrance of our garden as we celebrate 125 years of continuous service. Your brick will create a lasting tribute and become a part of our ‘home’ for generations to come. Complete the online form below by entering 3 lines (up to 18 characters per line including spaces) for your inscription and be sure to let us know if your gift should be acknowledged to someone special by including their mailing address. And be sure to let us know where you want your brick placed – in our garden or at our entrance. OR, you can download a form and mail it in (preferred method) by clicking here: download .pdf form.